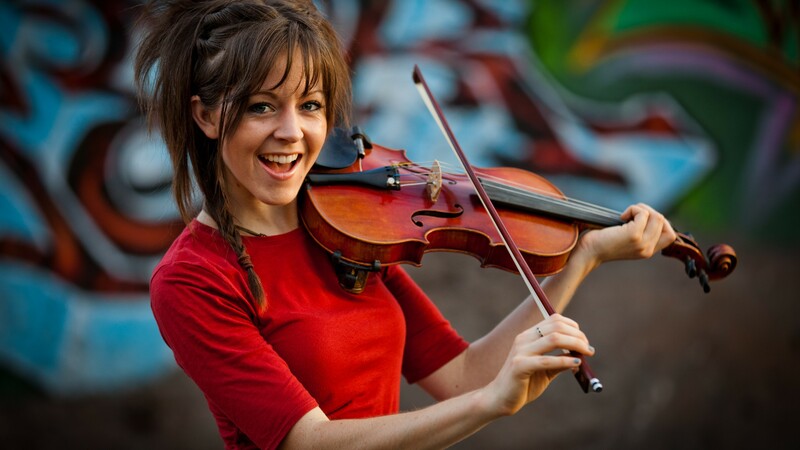 EDM violinist and YouTube superstar Lindsey Stirling steps up the dance factor on her third studio album, bringing in more well-known producers and features to further propel her into the public consciousness. The combination of pounding, dubstep-influenced beats with her signature rapid-fire violin sound that we’ve come to love from her since her first viral video (2012’s “Crystallize”) persists here and is taken to new heights. I can truly say that one of the coolest moments of my life is when I attended Stirling’s concert at VidCon 2013, turned around to observe the crowd and saw hundreds of people dancing to violin music. Stirling takes a classical instrument not typically utilized in today’s world of pop music and makes it incredibly modern. More recognizable names show up on the project than in her previous works, contributing to the quality of both the more pop-leaning hooks provided by the guest vocalists and the electronic aspects. Songwriting and production duo Rock Mafia appear on instrumental standout “The Phoenix” as well as craft Shiny Toy Guns vocalist Carah Faye’s powerful chorus on “Where Do We Go”. EDM force Robert DeLong adds his flair to “Prism”, and superstar electronic musician-turned-pop producer Zedd makes his presence felt on “Love’s Just A Feeling”. which could easily pass for one of his own songs. The album is split between Stirling’s solo tracks carried by her creative violin melodies, and songs with contributions by a guest vocalist, more of a rarity in her earlier days. The violin replaces where the dance breakdown would typically be in an EDM song, therefore still allowing her to have a prominent presence on these songs. Neither half rises over the other, as the main draw to the album is without question Stirling’s dexterity with her instrument which is featured heavily regardless. The guest vocalists never outshine her, instead complementing nicely, many of the soft-spoken indie variety. Christina Perri’s turn on “Brave Enough” and country duo Dan + Shays’s “Those Days” deserve special recognition, although the fact that a song now exists which features an EDM violinist, a Christian rapper (Lecrae) and the frontman of Weezer is quite remarkable (Don’t Let This Feeling Fade). Genres are entirely thrown out the window on this project as they have for the majority of Stirling’s career: another track boasts Indian songstress Raja Kumari, blending Stirling’s work with classical elements of Indian music. It really goes to show how confident in her artistry Stirling is to apply her trademark style to so many facets of the music world. Her musicianship is displayed most prominently when it exists all on its own, however. When all the bombastic production is stripped away, Stirling really is incredibly proficient with her instrument. “The Arena”, already released as a single, stands out among the pack, as the bass rumbles behind Stirling’s violin spinning rapidly through 32nd and 64th notes. It is a truly dizzying and impressive piece of art. “Prism”, on the other hand, her her applying pizzicato techniques in order to sound like a typical chopped-up vocal sample. EDM musician Robert DeLong’s added electronic quirks add to the overall Skrillex-sounding vibe. “Gavi’s Song”, which closes out the album, displays another dimension altogether: essentially a pure, emotional classical violin song without any semblance of an accompanying beat. The song was written for Stirling’s touring keyboardist and close friend Jason Gaviati, who passed away last year. To evoke this much emotion without a single word shows immense talent. All in all, even as a listener of a great variety of musical genres, it surprises me that a full-length album centred on a violin could be this captivating. Stirling’s insistence on pushing the envelope of classical music creates something that is consistently new and interesting, as does her blending of every genre under the sun into her already hybrid world, ranging from country to Bollywood. This much unbridled creativity on a third release only shows exceptional promise.